For-Profit Colleges: Educators or Predators? When Yasmine Issa found herself, at 24, unemployed and a recently divorced mother of twins, she turned to the Sanford-Brown Institute, a for-profit, or proprietary, college in White Plains, N.Y., that offered an ultrasound sonography program and promised her job-placement opportunities. But a completed program and $15,000 in federal loans later, Issa missed the catch: the program was not accredited. "I was somebody no one wanted to hire," she says. Issa testified on Thursday before the Senate Health, Education, Labor and Pensions Committee as part of a new investigation into federal investment in higher education. Congress last instituted reforms in the for-profit education sector two decades ago, but federal aid to students at for-profit schools has rapidly increased, approaching $24 billion last year, with an additional $36 billion Pell Grant boost approved in March. A report released late last week by chairman Senator Tom Harkin found that up to 90% of for-profit schools' revenue comes from Washington and that for-profit students are graduating with more debt than students at public or private nonprofit universities. With 96% of proprietary students taking out loans, and nearly half of them defaulting, taxpayers foot the bill. At current increasing enrollment and loan rates, testified Steve Eisman (famous for waging war against the subprime-mortgage market in 2008), there could be $330 billion in defaults in the coming decade. "The taxpayers are being taken for a ride on this," Senator Harkin told TIME. "Taxpayers, I think rightfully, are saying, 'Yes, you can take my tax dollars to help educate kids; that's good for us and our country.' But I don't know that the taxpayers want their money to go to institutions to pay the shareholders huge profits." Government money, lightly supervised institutions, unchecked supervising bodies and debt-trapped students  it all sounds similar to the subprime-mortgage collapse that is still fresh in America's mind. "The analogies are unbelievable," said Barmak Nassirian of the American Association of Collegiate Registrars and Admissions Officers, linking the for-profit education boom to the savings-and-loan crisis of the 1980s, the dotcom boom of the '90s and the recent mortgage bubble, which was helped along by lax credit-rating agencies and loose regulation. For-profit school leaders deny the parallel. "It's silly and simplistic," responds Harris Miller, CEO and president of the Career College Association. "The analogy between the [for-profit college] accrediting bodies and the [credit] rating service is absolute nonsense." Corinthian Colleges Inc. downplays default numbers and cites an Office of Management and Budget figure showing that loan-repayment rates have actually risen in the past decade. Apollo Group, the University of Phoenix umbrella, cautions that federal student and default data itself is unreliable and can't be used in its current state to guide regulation. "The federal government's Integrated Postsecondary Education Data System does a poor job of capturing the nation's next-generation learners, who comprise the majority of the university's student body," Apollo Group spokesman Manny Rivera said. The House's proposed accountability rules only start to address limited Department of Education graduation data and unreliable self-reported school figures. Moreover, Harkin's findings indicate that there is no information available on how private schools spend Higher Education Act student-assistance dollars. Congress is seeking to create a Consumer Financial Protection Bureau (CFPB) to oversee private student loans. Other for-profit industry ties to Washington remain murky. Last month, House Republicans nominated the only for-profit members  Keiser University chancellor Arthur Keiser and University of Phoenix president William Pepicello  to the Secretary of Education's accreditation advisory committee, the National Advisory Committee on Institutional Quality and Integrity. While direct political contributions from the Career College Association, Apollo Group and Corinthian Colleges Inc. have totaled only $923,000 since 2006, their lobby maintains a strong presence. Issa's story parallels hundreds of others that Senator Harkin's office received recently. The refrain is usually the same: after being lured by aggressive recruitment and advertising strategies, low-income students leave proprietary schools unemployed and trapped in debt. Deanne Loonin, director of the National Consumer Law Center's Student Loan Borrower Assistance Project, has seen for-profit student clients seeking help with loan defaults for nearly 20 years. Not one client, she claims, got a job in his or her anticipated field. "The schools are playing the role of the brokers who are pushing the products on the vulnerable population," Loonin remarked. The Health, Education, Labor and Pensions Committee appears divided on the next steps as it awaits July's for-profit-education hearing. Ranking member Senator Michael Enzi disavowed the partisan nature of Harkin's report. But for Senator Al Franken the solution is simple: "Well, we have a job here," he said at the committee hearings, "and part of it is to look out for Ms. Issa, look out for the taxpayer, and I'll be damned if I'm going to be a Senator and not do that job." 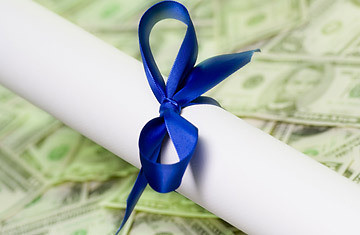 For-profit education may again face tougher regulations and oversight from Washington. See the top 10 college presidents.